Nowadays smartphones have been endowed with powerful camera and easy internet connectivity, many guys prefer to capture memorable life moments for real-time social sharing via smartphone. If you just replaced old iPhone with a brand new Android phone like Samsung Galaxy S8/S8+, it’s without saying that you don’t want to lose your precious photographs after you made the switch. Continue reading, you will get 3 methods about how to transfer photos and videos from iPhone to Android quickly. Part 1. How to Transfer iPhone Photos/Videos to Android by Drag-and-Drop? Part 2. How to Send iPhone Photos to Android Wirelessly Using Google Plus? Part 3. How to Transfer Photos and Videos from iPhone to Android in One Click? This is the easiest way to send photos and videos from iPhone to Android that you don’t need to install anything on your computer and smartphones. Connect iPhone and Android phone to computer via USB. Go to Computer, click iPhone -> Internal Storage -> DCIM -> copy all photo albums. Go to Computer, click Android phone icon -> Phone -> navigate and open DCIM folder-> paste all photos and videos to Android phone. Note: If your Android device cannot be detected by computer, please make sure that you have installed the USB driver. Still have problem in connecting Android phone to computer, please fix it by following this guide. Alternatively, you can use Google+ app to transfer pictures from iPhone to Android freely and quickly. Please connect both iPhone and Android phone to network via WiFi. Download Google+ app from App Store, then install it on your iPhone. Run Google+ on your iPhone, sign in with your Google account. Go to back up your photos page to turn on auto backup, shortly please allow to back up your photos in camera roll. Start Google+ on Android phone, sign in with the same Google account. Go to Photos section, you will discover that all the iPhone photos are viewable now. Note: The photos on Google Plus are accessible from any device as long as you successfully signed in to Google with the same Gmail account. It’s a great way to store all your pictures and photographs in one place. 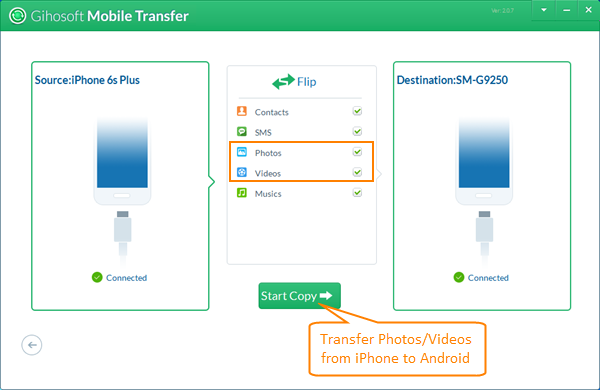 Additionally, you can transfer iPhone photos/videos to Android with assistance of Gihosoft Mobile Data Transfer software. It allows you to transfer all photos, videos, music, contacts, SMS, calendar from iPhone to all popular Android devices efficiently. Step 2. Tap “Phone to Phone” then connect iPhone and Android device to computer with USB. Step 3. Tick Photos and Videos, then copy all iPhone photos and videos to Android device. Note: The transfer process will take a while, please wait and keep the two phones connected to computer during the process. When it has finished, you will be notified with a message. This method is so convenient and easy that you can transfer photos and pictures from iPhone to all Android devices such as Samsung Galaxy S8/S8+/S7/S7 Edge, HTC A9/M9, LG V10/G5, Sony, Motorola, OnePlus, Google and more. What’s more, Gihosoft Phone to Phone transfer software can also transfer music from iPhone to Android.